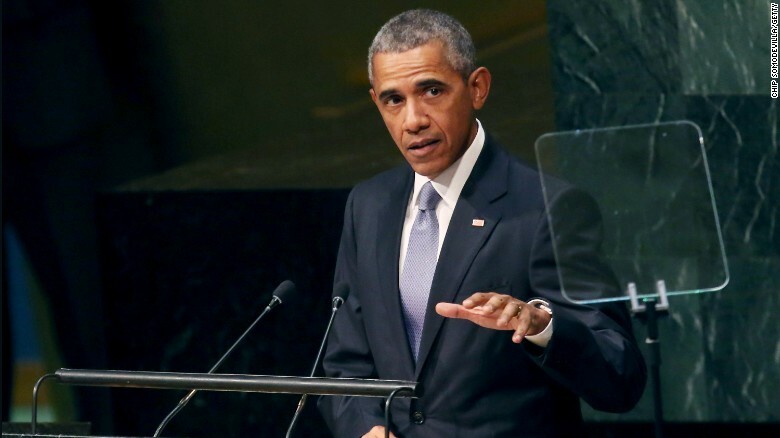 At this year’s United Nations General Assembly 70th anniversary, President Obama spoke at the Opening Session, filling the room with talk of diplomacy, democracy, and human rights. He did not shy away from addressing controversial topics that involved Russia, China, Iran, and Syria and reminded the world that cooperation over conflict must be recognized, especially in the United States, as a strength rather than a weakness. He was there to elaborate on what the U.N. really stands for by highlighting it in contrast with arguments found today in foreign policy, such as “might makes right,” “that strong states must impose their will on weaker ones,” and “that rights of individuals don’t matter.” President Obama made it very clear in never hesitating to protect our country with top military force, but also stressed the fact that we live in a much more integrated world; we all have a stake in each other’s success, and if the nations there cannot work together more effectively, then all will suffer the consequences. That when tens of thousands of people are slaughtered in one country where an “apocalyptic cult like ISIL” or a torturous dictator like Assad exist, it is no longer a single nation’s security problem, but rather an assault on humanity. With the chaos and conflict happening in or affecting multiple regions of the world, President Obama took the time to not only call out other world leaders, but also acknowledge and reflect on past mistakes made by the United States and the administration. This in an effort to illustrate what steps are necessary to move forward and ensure such harmful mistakes do not take place again. He spoke of specifics such as the hard lessons learned in Iraq, as one nation cannot impose stability on another, or the fact that the coalition in Libya that took down a tyrant should have done much more to fill the vacuum that left Libya in a civil war with no official government established. Although President Obama took the time to recognize the work done with partners, including Russia and China, in creating a comprehensive deal that prevents Iran from obtaining a nuclear weapon, he did not go without promoting key international law such as Ukraine’s sovereignty and territorial integrity that had been violated by Russia. Essentially, President Obama rose to the occasion of speaking out against atrocities, as controversial as they may be, and while never undermining the difficulty of what is required of any call to action, painted a picture of what should and could be done. Such a picture includes working with any nation in resolving the deadly conflict in Syria, and joining with more than 50 countries in a U.N. peacekeeping effort to ensure peace agreements are carried out and civilians are protected from mass killings. As President Obama ended his speech looking into the future, one must remember that the key elements he spoke of must, by far, surpass his term. The basic ideals of diplomacy, democracy, and human rights are not, and should not, be recognized and associated with only one specific party or specific country, but by all nations, as it is not simply a matter of what is right, but also what is best for the prosperity of any country and region. Below please see the entire text of President Obama’s speech at the Opening Session of the 70th United Nations General Assembly, or Watch it online! HAPPY FOURTH OF JULY, IT’S IRAQ AND SYRIA TOGETHER AND SPREADING LIKE MERS IN SAUDI ARABIA! 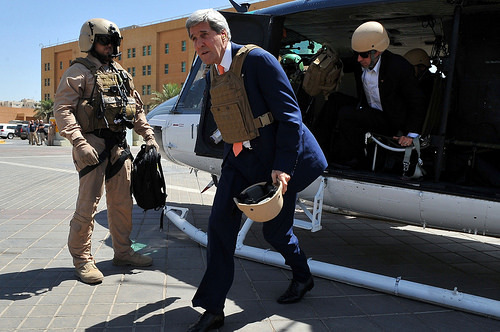 Secretary Kerry arrives in Baghdad to meet with Iraqi leaders. As we watch the continued Syrian bloodbath, we are seeing some effort to recover from the UN Security Council vetoes by Russia and China of a sanctions, cease fire, and process of regime change resolution. While the al-Assad proposed referendum on a new constitution aims to quiet the dissent, given the killing, it is unlikely to be accepted by the opposition as it does not remove the present rulers. It seems like an effort to buy time to continue with repressive measures. China and Russia have or are going to send missions to Assad but so far they have had no success in stopping the killing. The best solution would be if Assad would step down but this remains unlikely. Now the UN General Assembly has voted overwhelmingly (137 in favor, 12 against, and 17 abstained) for a similar but non-binding resolution, which will, in effect, throw the ball into the court of the Arab League, EU, Turkey, and a “Friends of Syria” group supported by the U.S. The aim is to get help for the opposition and, if possible, to establish a broad national unity provisional government. But the issue is how to act effectively to get the incipient but very deadly civil war to speedily stop; that probably will require multilateral peacekeeping forces not only to separate the contenting sides but ensure that a dangerous revenge and brutal “score setting” process is mitigated and to permit diplomacy and conciliation as well as civic society to function. The Syrians themselves must also come together so that all groups have a role, the rights of minorities are ensured, and rule of law and democracy are established by any new government. The inducement could be recognition by the international community. Such an effort might even move Russia and China to stop their backing of Bashar al-Assad. Yet the real issue is whether there is a strategy that can stop in short order the carnage that is still taking place engendered by a determined and dictatorial al-Assam regime. This biog early on advocated the use of an international intervention peacekeeping and peacemaking force after a General Assembly UN resolution was passed and supported by the Arab League. Some Gulf States later supported informally such a peacekeeping effort but clearly wanted even broader backing by others. The UN Human Rights Commissioner also supported international efforts to stop the killings. Now the time has come and several requirements and actions are needed. The first is a consensus among the key actors – namely the Arab league, Turkey, the EU, possibly NATO, as well as humanitarian units of the UN system such as UNHCR, UNDP. Each can provide their resources especially to deal with the refugees and those at risk, to supply medical help and food, and to get the economy started again. Some commentators have said that it would take months for an effort to get underway…that is months in which the Assam regime can pound into the ground the civilian population and leave added thousands dead. That is not acceptable since the resources sufficient to stop the killing exist and need simply a “go” from the key political leaders. Here Turkey is key. Again, as we have noted, this can all be done without U.S. boots on the ground but with some logistic support, economic assistance, and perhaps some help with a no flight zone being established. The end game now is to stop the killing; the second goal must be the formation of a new national government made up of all groups in the population of Syria in place of Bashar al-Assad’s now discredited and criminal regime. We have come to the point when a “coalition of the willing” and regional organizations need to step in where neither China nor Russia have a veto. The first step is to recognize a responsible and broad-based opposition organization which has representatives of all groups and for the key nations to recognize this as the legitimate government of Syria, and to have the new regime request international peacekeepers with a strong mandate and humanitarian assistance. The best solution is not only a new broad-based government but, frankly, there is need for a peacekeeping and peacemaking multilateral force with a strong mandate. The strong mandate must be not only to stop the killing but also to create the conditions for fair and peaceful interim government of national unity composed of respected leaders from all groups and to establish free and fair elections as soon as conditions permit. The other condition must be that any future government and new constitution and law must protect human rights, create the reality of rule of law, and establish the protection and rights of minorities. There is no room now for individual extra-legal vendettas such as the ones we are starting to see in Iraq. Realistically, the two main actors in setting up such an action is the Arab League and Turkey, which shares a border with Syria and has the largest trained army in the region (indeed even in Europe). But there is need also for a United Nations presence, especially for humanitarian work and to supervise the elections. There is also room for some economic assistance to create jobs and hope. Time is of the essence now, as sanctions, absent the prospects of early armed peacekeepers, are unlikely to deter an Assad regime which seems impervious to reason or moral persuasion. Once again, the internationally agreed “responsibility to protect” is at a crucial testing point.